This article is about the city in Oakland County. For the township in Newaygo County, see Troy Township, Michigan. Troy is an affluent city in Oakland County in the U.S. state of Michigan, and is a suburb of Detroit. The population was 80,980 at the 2010 census, making it the 11th-largest city in Michigan by population, and the largest city in Oakland County. 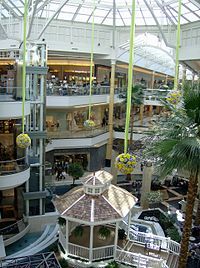 Troy has become a business and shopping destination in the Metro Detroit area, with numerous office centers and the upscale Somerset Collection mall. In 2011, Troy was ranked the safest city in Michigan, as well as the 19th safest city in the nation. In 2008, Troy was ranked 22nd on a list of "Best Places to Live" in the United States  by CNN Money, using criteria including housing, quality of education, economic strength, and recreational opportunities. In 2008, Troy ranked as the fourth most affordable U.S. city with a median household income of approximately $79,000. The first land purchases in what became Troy Township were recorded in 1819 in section 19. The first settlement, known as Troy Corners, originated two years later when Johnson Niles purchased 160 acres (65 ha) in what is now the north-central portion of the city. Four years later, Ira Smith built the first house at Big Beaver Corners, and the first public school opened at Troy Corners. Troy Township was organized on May 28, 1827. The City of Troy was incorporated in 1955, mainly as a way to prevent neighboring cities (Clawson, Royal Oak, and Birmingham) from incorporating any more of its land into their cities. In 1966, I-75 was completed in Troy, which increased access to and from the city. This gave a major boost to Troy's economy, leading to the development of its civic center, school district, and recreation system. According to the United States Census Bureau, the city has a total area of 33.6 square miles (87 km2)—33.5 square miles (86.9 km²) of it is land and 0.1 square miles (0.26 km2) of it (0.30%) is water. The latitude of Troy is 42.605 N, and the longitude is 83.15 W. The mean elevation is 748 ft (228 m). The Troy Historic Village is a fully interactive historical museum chronicling the different stages of Troy's progression from its first settlers to the city it has become today. Located at the corners of Livernois Road and Wattles Road, the village is located behind the old city hall building. Open year round, the village has ten original, complete structures which patrons may enter and observe how they functioned in the past and how they were decorated, as all buildings are full of artifacts from that period. Each structure is original and was painstakingly moved from its original location to the museum intact. Starting with a log and mud structure used by the first settlers, there is also an 18th-century schoolhouse and estate, a general store, a blacksmith's shop, a church along with the pastor's home, and the old city hall, which acts as a general museum. There is a gazebo in the center of the square which will host parties and period bands during annual festivities. Many schools from around the area plan field trips to the museum, and the church is also available for weddings. In the summer of 2005, to commemorate the city's 50th anniversary, ceramic beaver statues, each standing four feet (1.2 m) high, were displayed at various locations in the city. The beaver is the symbol of Troy, and the city's main commercial thoroughfare (Big Beaver Road) is named after it. Troy is also home to two of the largest Protestant churches in the USA, Kensington Community Church and Woodside Bible Church. In 2003, Troy was named Michigan's Sportstown by Sports Illustrated magazine for having the top community sports programs in the state. Troy is home to the Troy Sports Center, which is the official training facility of the Detroit Red Wings of the NHL. The facility is also used for indoor soccer, hockey, and lacrosse leagues, and is home to the city's high school hockey teams. In addition to the Detroit News and Detroit Free Press, regional newspapers serving all of southeast Michigan, the city is served by the Daily Tribune (published daily), the Observer & Eccentric (which is published twice a week), the Troy Beacon (published every Thursday), the Troy Times, and the Troy-Somerset Gazette  and, most recently, Troy Patch. The Troy Eccentric newspaper edition ceased publication in 2009. The Somerset Collection in Troy is a popular upscale shopping center. Troy is a thriving center of business, particularly in the automotive and financial sectors, and is home to a number of major companies. Troy has the second highest cumulative property value in Michigan, second only to Detroit. Troy is home to the upscale Somerset Collection mall, featuring a skywalk and over 180 stores, and the Oakland Mall. The Top of Troy is the city's tallest building with offices of PNC Financial Services. Bank of America maintains a major operations center in Troy. Planners have proposed the Pavilions of Troy project for the city, a landscaped square with boulevards lined with upscale shops, restaurants, offices, a theater, and condominiums. In 2012 Mahindra & Mahindra opened a technical center in Troy. The Top of Troy is the tallest building in the city. ^ Arbor Drugs was headquartered in Troy until it was acquired by CVS Corporation in 1998 for an estimated $1.48 billion, in the process making CVS the nation's largest chain-drug retailer. ^^ Frank's Nursery & Crafts was an arts and crafts chain spanning 14 states that was headquartered in Troy, even after being acquired by General Host Corporation in 1983. The company filed for bankruptcy in 2004, and became defunct soon after. ^^^Kmart was headquartered in Troy until it acquired Sears in 2005, establishing itself in the former Sears headquarters in Hoffman Estates, Illinois. Its massive headquarters still remains, though it is scheduled for demolition and the creation of a landscaped square with boulevards lined with upscale shops, restaurants, offices, a theater, and condominiums. According to the United States Census Bureau, the city has a total area of 33.64 square miles (87.13 km2), of which, 33.47 square miles (86.69 km2) is land and 0.17 square miles (0.44 km2) is water. According to a 2007 estimate, the median income for a household in the city was $84,330, and the median income for a family was $101,271. Males had a median income of $66,475 versus $41,026 for females. The per capita income for the city was $35,936. About 1.7% of families and 2.7% of the population were below the poverty line, including 2.2% of those under age 18 and 5.5% of those age 65 or over. As of the census of 2010, there were 80,980 people, 30,703 households, and 22,443 families residing in the city. The population density was 2,419.5 inhabitants per square mile (934.2 /km2). There were 32,907 housing units at an average density of 983.2 per square mile (379.6 /km2). The racial makeup of the city was 74.1% White, 4.0% African American, 0.2% Native American, 19.1% Asian, 0.6% from other races, and 2.0% from two or more races. Hispanic or Latino of any race were 2.1% of the population. There were 30,703 households of which 34.7% had children under the age of 18 living with them, 62.8% were married couples living together, 7.3% had a female householder with no husband present, 3.0% had a male householder with no wife present, and 26.9% were non-families. 23.4% of all households were made up of individuals and 9.6% had someone living alone who was 65 years of age or older. The average household size was 2.63 and the average family size was 3.14. The median age in the city was 41.8 years. 23.8% of residents were under the age of 18; 6.7% were between the ages of 18 and 24; 24% were from 25 to 44; 31.6% were from 45 to 64; and 13.8% were 65 years of age or older. The gender makeup of the city was 49.3% male and 50.7% female. As of 2011 almost one in five residents was Asian. From the census of 2000, there were 80,959 people, 30,018 households, and 21,883 families residing in the city. The population density was 2,413.9 people per square mile (932.0/km²). There were 30,872 housing units at an average density of 920.5 per square mile (355.4/km²). The racial makeup of the city was 82.30% White, 2.09% African American, 0.15% Native American, 13.25% Asian, 0.02% Pacific Islander, 0.36% from other races, and 1.82% from two or more races. 1.46% of the population is Hispanic or Latino of any race. There were 30,018 households out of which 36.9% had children under the age of 18 living with them, 64.5% were married couples living together, 6.0% had a female householder with no husband present, and 27.1% were non-families. 22.8% of all households were made up of individuals and 7.8% had someone living alone who was 65 years of age or older. The average household size was 2.69 and the average family size was 3.23. In the city the population was spread out with 26.2% under the age of 18, 6.7% from 18 to 24, 29.8% from 25 to 44, 27.1% from 45 to 64, and 10.2% who were 65 years of age or older. The median age was 38 years. For every 100 females there were 98.1 males. For every 100 females age 18 and over, there were 94.8 males. From 1990 to 2000, of all of the municipalities in Oakland, Wayne, and Macomb counties, Troy had the highest numeric growth in the Asian population. It had 4,932 Asians according to the 1990 U.S. Census and 10,730 according to the 2000 U.S. Census, an increase of 5,798 Asians. The increase gave Troy the largest Asian-American population in the tri-county area, surpassing that of Detroit. Troy uses the Council-Manager form of government, and thus is governed by a City Council consisting of a Mayor and six council members. The city council appoints a City Manager, who manages the day-to-day operations of the city. The City of Troy and City of Clawson on its southern border compose Michigan's 41st District for State Representative. The district has been represented in the State House by Marty Knollenberg since 2007, and in the state Senate by John Pappageorge, also since 2007. On the national level, Troy was part of the 9th district, represented by Joe Knollenberg from 1993–2009 and Gary Peters, who defeated Knollenberg in a highly publicized race in November 2008. Currently, Troy is part of the 11th district, held by Republican Kerry Bentivolio. In May 2010, the Troy city council voted to adopt a budget that called for the Troy Public Library to close on July 1, 2011. A proposal was made to increase property taxes in order for the library to run independently, but the citizens voted it down by a 2.2 percent margin. A recall petition filed in June 2012 successfully placed mayor Janice Daniels on the November 2012 election ballot. Daniels was recalled. Troy is home to Walsh College, a business oriented school, as well as branches for the University of Phoenix, Northwood University, Central Michigan University, Spring Arbor University, International Academy of Design and Technology, and ITT Technical Institute. Michigan State University also has its Management Education Center (Eli Broad College of Business) located off of I-75 near the intersection of Crooks Rd. and Square Lake Rd. (19 Mile). Troy is well known for its exemplary public school district both in Michigan and nationally. The Troy School District has six national blue ribbon and 13 State Exemplary Schools. The schools have a 99% graduation rate, with 95% of those students going on to higher education and 2% going on to military service. Both Troy High School and Athens High School were named to the list of The 1000 Most Outstanding High Schools in the United States by Newsweek magazine. The Troy School District hosts the eastern branch of the International Academy, currently ranked 7th in the Newsweek rankings of the best public high schools in the United States. The school has been located in the older Baker Middle School building since the beginning of the 2008-2009 academic year. Previously, Troy sent students through the class of 2011 to the central IA campus in Bloomfield Hills. A small portion of the southwest corner of Troy is districted in Birmingham Public Schools and a portion of the northwest corner is in Avondale School District. Oakland-Troy Airport (FAA LID: VLL, ICAO: KVLL), formerly (IATA: 7D2, ICAO: K7D2) is a small suburban general aviation airport operated by Oakland County and has a single 3,550 feet x 60 feet (1082 m x 18 m) paved runway. The Oakland-Troy Airport is considered the County's 'executive' airport. Business travelers and tourists using private, corporate and charter aircraft benefit from the airport's convenient proximity to business, recreation and entertainment facilities. It is located between Maple Road and 14 Mile Road. Charter passenger, air freight, as well as aircraft maintenance and fuel, are available on the field. Troy was also home to the Big Beaver Airport, (IATA: 3BB), which was located at the corners of Big Beaver Road and John R Road. It opened in 1946 and closed in 1995 due to declining use and pressure to sell the land for commercial development. I-75 cuts through the middle of Troy from the north-west corner bordering Bloomfield Township, and continuing southward towards the south-east border of the city entering Madison Heights. Exit numbers 65, 67, 69, and 72 directly service Troy. M-1/Woodward Avenue and US-24/Telegraph Road are on the west side of Troy and provide access to the city. ^ "Best places to live 2008". CNN. http://money.cnn.com/magazines/moneymag/bplive/2008/snapshots/PL2680700.html. ^ "Monthly Averages for Troy, MI (48098)". The Weather Channel. http://www.weather.com/weather/wxclimatology/monthly/48098. Retrieved January 20, 2013. ^ Schulman, Andrew. "City takes SI Sportstown honor for Michigan". [Sports Illustrated]. http://sportsillustrated.cnn.com/magazine/features/si50/states/michigan/sports_town/. Retrieved 2011-05-01. ^ a b A town square for Troy? ^ Thakkar, Ketan. "Mahindra & Mahindra opens technical centre in Troy, Michigan." Economic Times. September 25, 2012. Retrieved on November 6, 2013. ^ Steele, Micki. "Asian-Americans settle in Metro Detroit enclaves." The Detroit News (EN). 2011-04-19. "Almost one in five residents of Troy is Asian." ^ Metzger, Kurt and Jason Booza. "Asians in the United States, Michigan and Metropolitan Detroit." Center for Urban Studies, Wayne State University. January 2002 Working Paper Series, No. 7. p. 7. Retrieved on November 6, 2013. ^ Metzger, Kurt and Jason Booza. "Asians in the United States, Michigan and Metropolitan Detroit." Center for Urban Studies, Wayne State University. January 2002 Working Paper Series, No. 7. p. 10. Retrieved on November 6, 2013. ^ "Frequently Asked Questions about the Library Closing". Troy Public Library. 2010-06-03. http://www.troylibrary.info/node/490. Retrieved 2011-04-11. ^ "Troy deals with library loss". Daily Tribune. 2010-11-03. http://www.dailytribune.com/articles/2010/11/03/news/doc4cd2254f9eb6b123407078.txt. Retrieved 2011-04-11. This page uses content from the English language Wikipedia. The original content was at Troy, Michigan. The list of authors can be seen in the page history. As with this Familypedia wiki, the content of Wikipedia is available under the Creative Commons License.